There is nothing "ordinary" about this beautifully written novel. The American Midwest in the 1960s—a time of innocence lost and a world discovered. For my money it rivals To Kill a Mockingbird in reach and scope, wisdom and faith, hope and grace. Award-winning author William Kent Krueger has gained an immense readership for his Cork O'Connor series. 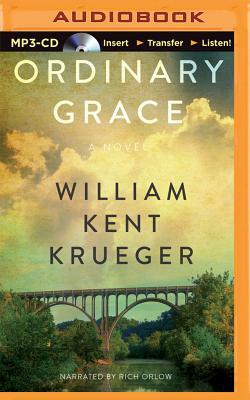 In Ordinary Grace, Krueger looks back to 1961 to tell the story of Frank Drum, a boy on the cusp of manhood. A typical 13-year-old with a strong, loving family, Frank is devastated when a tragedy forces him to face the unthinkable--and to take on a maturity beyond his years.